A still from the 2018 film "First Man," in which Ryan Gosling plays famed Apollo 11 astronaut Neil Armstrong. John M. Logsdon is most recently the editor of "The Penguin Book of Outer Space Exploration: NASA and the Incredible Story of Human Spaceflight." He is Professor Emeritus and founder of George Washington University’s Space Policy Institute and author of "John F. Kennedy and the Race to the Moon." Logsdon contributed this article to Space.com's Expert Voices: Op-Ed & Insights. Historian, author and space-policy expert John Logsdon, editor of the "The Penguin Book of Outer Space Exploration: NASA and the Incredible Story of Human Spaceflight" (Penguin Classics, 2018). dissertation turned into a book titled "The Decision to Go to the Moon;" it was almost completed by the time of the initial launch to the lunar surface. I was at Kennedy Space Center on the morning of July 16, 1969, standing outside the Operations and Checkout Building as Armstrong, Aldrin, and Collins walked by me on their way to the launch pad, a scene shown in the new Universal Pictures film "First Man." So I should have been a prime candidate for enjoying a film culminating in the remarkable achievement of Apollo 11. Instead, I walked away disappointed, even a bit sad. I found it a distortion of the personalities involved and a less-than-convincing account of the U.S. space program of the 1960s, with an overemphasis on special effects substituted for the explanatory narrative needed to truly understand these men and their accomplishments. Above all, I found it a disservice to the memory of its central character, Neil Armstrong. It was certainly the prerogative of director Damien Chazelle, scriptwriter Josh Singer and all those involved to make the movie they envisioned, and they reportedly went to great lengths to make it as technically accurate as possible. But what they created was an overly somber mood piece, not a celebration of the remarkable achievement that was Apollo. 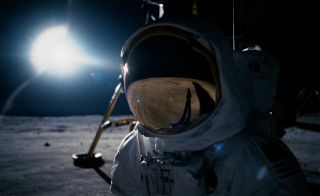 The moviemakers have repeatedly stressed that the film is an invented drama based on real events, not a true-to-the-facts documentary, but to me that drama is not a fair representation either of either Armstrong in reality or of his characterization in Jim Hansen’s book "The First Man," on which the movie is based. The film portrays Armstrong as a stoic, on-the-surface almost emotionless individual focused only on success in his role as a test pilot and astronaut. Beneath that surface, he is deeply affected by the 1962 death of his 2-year old daughter. Her passing haunts him in the years leading up to the lunar landing, and leads to a climactic scene on the moon that almost certainly never happened. For example, the commander of the Apollo 8 mission, Frank Borman, was sent by NASA to the White House at President Nixon’s request to help prepare for the Apollo 11 celebrations. In that role, Borman, on July 14, 1969, two days before Apollo 11 was launched, sent a memo to Nixon providing "background information" on the crew. Here is how he described Neil Armstrong: "Quiet, perceptive, thoroughly decent man . . . A little reserved, but when [you] get to know him, he has a very warm personality." The key phrase there, to me, is "get to know him." This is the Armstrong I came to know. It’s a shame viewers of the film won’t get that chance. I worry that in the years to come many will remember the film’s unflattering characterization of Neil Armstrong rather than the warm, engaging person he in reality was. The "heavy" in the film is Buzz Aldrin, portrayed as cynical and negative, disregarding of all social etiquette to the extreme. Buzz certainly was then and is now a tightly wound person. Borman’s memo described him as "almost humorless, a serious personality." But it is very unlikely that the real Aldrin would have made the kind of demeaning comments put in the mouth of his film counterpart. In lieu of a complex human, we get a caricature presented in sound bites. To me, "First Man" is a missed opportunity to bring the full resources of the film industry to bear on delivering an inside view of one of humanity’s most remarkable achievements. I am convinced that capturing the reality of Apollo 11 and of Neil Armstrong and the thousands of others responsible for its success would have made a more satisfying movie than what this film gives us. In a May 1961 memo recommending that the president officially make landing an American on the moon a national goal, NASA Administrator James Webb and Secretary of Defense Robert McNamara observed that it is "man, not merely machines, in space that captures the imagination of the world." Nearly 60 years later, "First Man" could have demonstrated their point. But when the real men disappear in favor of characters better befitting a drama built for Hollywood’s awards season, we are put at risk of losing our cultural memory of a magnificent human achievement.